The PictoGlow™ line of photo-luminescent products offers a broad selection of products designed to meet the varied requirements demanded by industry professionals. All products exceed regulatory safety standards and are manufactured using quality, high performance materials. With our all-aluminum path delineation system, a powerful strontium based photoluminescent mixture is permanently baked onto the aluminum sign surfaces. The unique scratch, chemical and fire resistant properties make these products ideal for installation in commercial and industrial facilities. 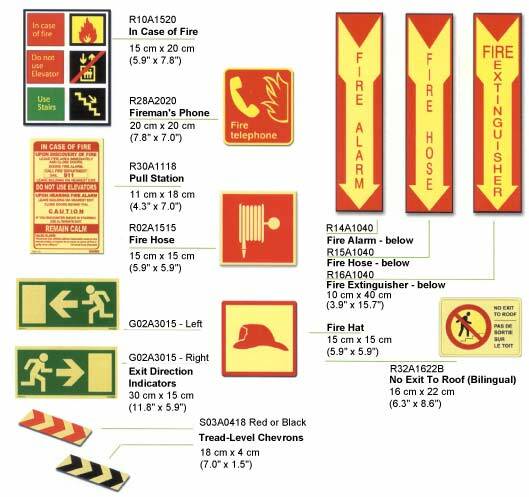 Local codes (NYC Local Law 26) will require annual inspection of photoluminescent wayfinding systems to maintain certification. Over the long run, quality all-alluminum products offer better durability and minimize maintenance and yearly replacement costs. Mechanical and high-bond adhesive mounting options are available to permanent fasten stair/pathmarkers and signs to concrete, wood, metal and plastered surfaces.